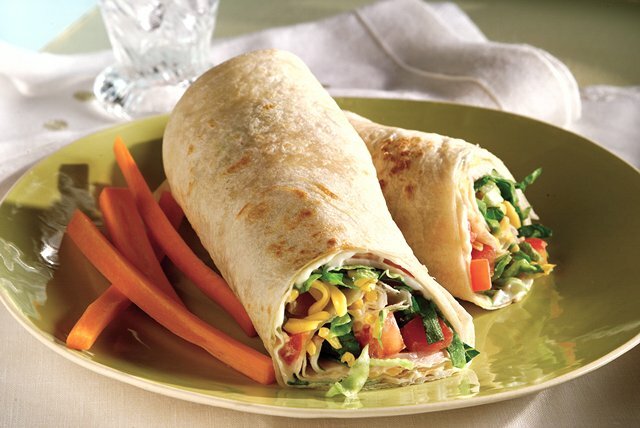 A tortilla is spread with non-fat dressing, topped with shaved turkey, lettuce, tomatoes and non-fat Cheddar then rolled up for a tasty sandwich. To make tortilla easier to roll and avoid cracking, wrap it in a clean, damp paper towel, then microwave on HIGH 10 sec. or just until warmed. To warm roll-up, prepare as directed omitting lettuce. Wrap in paper towel. Microwave on HIGH 30 sec. or until heated through.